The sixty sixth year after independence is likely to be a challenging one for the economy. It would be difficult to stop the continuance of last year’s economic slide this year due to weaknesses in macroeconomic fundamentals, a lack of recognition of these weaknesses, and consequently inadequate countervailing measures to mitigate the economic problems. The unwillingness and inability to undertake needed reforms and uncertainty and unpredictability of economic policies continue to hold up the realisation of the economy’s full potential.Global economic conditions and international politics are also impediments to economic growth. The fundamental macroeconomic weaknesses are the increasing rate of inflation, the continued high fiscal and trade deficits, huge foreign debt and balance of payments difficulties and the large public debt and its servicing costs that are a severe strain on the fiscal deficit and an underlying cause for inflation. At the end of last year the rate of inflation increased to nearly 10 per cent and this increasing trend has continued into 2013. Inflation, as measured by the Colombo Consumers’ Price Index (CCPI), accelerated from 9.2 per cent in December 2012 to 9.8 per cent in January 2013. This was the highest rate of inflation since August 2012 and portends an inflationary trend. The annual average change in inflation increased to 8.1 per cent in January 2013, the highest since August 2009, when it reached 8.5 per cent. Containing inflation will be an important challenge as it would affect the country’s international competitiveness and private investment. Current indications are that inflationary pressures would gallop. Already there are signs of increasing food and fuel prices. Although the Central Bank’s objective is to keep inflation at the middle level of a single digit, its realisation appears difficult. Food prices are exerting pressures on the general price level. If, however, weather conditions improve there may be a respite in food prices. Increases in prices of petroleum products, electricity and transport costs are likely to increase prices. 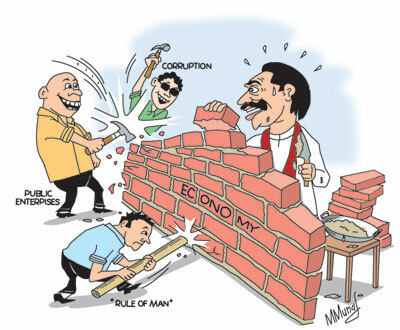 One of the persistent weaknesses of the Sri Lankan economy has been the large fiscal deficits. These have been brought down from its 8 percent level to less than 7 percent of GDP in 2011, but the target of 6.2 for last year, and 5.8 percent of GDP this year, are difficult to achieve as the containment of public expenditure has proven an onerous task. Losses in public enterprises absorb much of government expenditure, while debt servicing costs are high and rising. In 2011, the Ceylon Petroleum Corporation and Electricity Board incurred losses amounting to a massive Rs.119.5 billion. In 2012, in spite of significant price increases, losses of public enterprises increased to Rs.261 billion. Most of this amount was due to losses in these two large public entities. The Government’s approach to reducing these losses appears to be one of increasing prices of petroleum products and electricity tariffs. Price increases are expected to reduce losses of the two key public enterprises that have suffered large losses. While this may improve the fiscal balance to some extent, these increases in prices of public utilities would release upward pressures on prices. There may also be a beneficial impact on the trade balance if oil importation is decreased owing to higher prices leading to lower demand. What is needed is a reform of these institutions to increase their efficiencies and reduce the administration costs. Such an approach would not increase consumer prices. The reforms of state enterprises have, however, proven to be difficult owing to trade union and political factors. The huge losses of state enterprises continue to be a heavy burden on the budget and the economy. Economic reforms must extend to other areas as well. It is now quite clear that one of the important reasons for inadequate investment, especially of foreign investment, has been the Government’s veering towards greater state control and inadequate guarantees of security for private investment and private property. While other countries including erstwhile communist countries are providing secure havens for foreign investment, the international community’s confidence in the Sri Lankan economy is dwindling. Even though the figures indicate that the country obtained around US$ 1 billion last year, these have been property deals and investment in the hospitality trade, rather than needed investment in manufacturing for exports. It would be difficult to accelerate the growth momentum without substantial foreign investment in export industries. A bold measure to guarantee private property rights and foreign investment is urgently needed to put the economy back into a high trajectory of growth. Sri Lanka’s import-export economy is inextricably connected with global conditions that are not supportive of the economy. The slow growth of the global economy and US sanctions on an important trading partner, turmoil in several Middle Eastern countries and tariff and non-tariff barriers will affect the country’s trade balance adversely. While international developments are difficult to predict, the current conditions are not propitious. Although there is some hope that oil prices may be stable and even reduce owing to the slowing down of global economic growth, this could change if problems in oil producing countries lead to speculative prices. The country has already lost significantly from the US sanctions on Iran — both on the import and export side. The foreign exchange loss on oil imports has been significant, some estimates placing it at US$ 2 billion last year. The country has lost differed payments arrangements and concessionary pricing that now leads to higher oil import costs. It is in this context that the possibility of further hikes in petroleum prices has to be viewed. Furthermore, Iran is the country’s second largest market for tea. Consequently, the US embargo has hit the country’s main agricultural export as well. The slow growth of Western economies that are the main markets for our manufactures had a severe effect last year when manufactured exports fell significantly. There is no early prospect of a significant improvement in the US and European economies. Consequently we may see a further decline in manufactured exports. The loss of GSP Plus status that was thought as not hurting our exports in 2011, is decisively a factor in the decreasing exports. There is no likelihood of a restoration of this concession this year. Therefore Sri Lanka’s exports to Europe face severe price competition that may have to be remedied by the depreciation of the currency. Weather conditions will play an important role in the country’s economic performance. Improved weather conditions could be a favourable factor this year. Already last year’s enormous rainfall, though destroying crops and causing severe hardships to people, reduced the costs of electricity generation. If normal weather conditions prevail paddy and food crop production could increase and assert a downward impact on food price. Increased tea production could increase agricultural export earnings. It is important to avoid complacency and distractions from economic issues. A significant challenge facing the Government is the reform of key public enterprises to operate them more efficiently. The lack of rule of law and good governance are significant impediments on investment for higher growth. It is important to recognise the impediments and constraints to economic development seriously and institute reforms to put the country on a high trajectory of economic growth. Kudos to the women cricketers!